MPH has the capacity to lodge up to 50 people. We have a variety of rooms and prices for your needs and budget. The following gives a description of our dorm rooms, executive rooms, suites, and one apartment. All our rooms are very spacious with big windows looking out onto a quiet, backyard garden. Sheets, towels, soap and toilet paper are provided in all rooms. For prices please see our « Rates » page under « Reservations ». MPH has a set menu for breakfast, lunch, and supper. We serve a combination of American and Congolese cuisine, often using fresh vegetables and fruit from our garden. Breakfast is complimentary. Lunch and supper are provided on a sign-up basis and charged to your account. We ask that our guests sign up for lunch by 9:30 AM and for Supper by 3:30 PM. (Guests are charged for any meals for which they sign up, whether they eat or not.) We will hold meals for guests if they are late due to traffic and schedule conflicts. If possible, please call the manager if you anticipate you will be late. When you make a reservation at MPH for yourself or a 3rd party, please indicate whether you or your guest(s) would like to be signed up for a meal upon your arrival. Unless previous arrangements have been made, meals are provided during these hours only. Coffee and a light breakfast can be provided for those catching early morning flights, if you let the Operations Manager know in advance. Filtered drinking water is placed in rooms and pitchers can be refilled from the water cooler in the dinning area. Guests may sign up for morning or afternoon Coffee/Tea breaks. Guests may request a sandwich if they prefer a lighter meal or a sac lunch if they need something for the road. We offer a « Conference Menu » that provides a greater variety of Congolese meals with larger portions. Contact the Operations Manager. * We regret that at this time we cannot provide special provision for guests who are lactose intolerant, diabetic, or on low salt diets. Please bring any snacks or special dietary provisions that you are accustomed to needing. Guests are welcome to use the following facilities at MPH. Library/Lounge – located on the 2nd floor near the balcony. This room is also available for small group devotions between 8:00 & 9:00 AM. Soccerballs, basketballs, and frisbees are located in a tote near the ping-pong table. MPH has 2 conference rooms. One room can accomodate approximately 40 people and the other small meeting room is perfect for a group of 12 people. The conference rooms are airconditioned and have a drop down screens for powerpoint presentations. 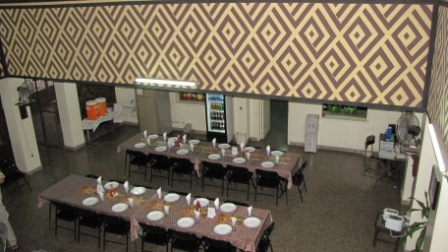 A Conference Menu can be selected which offers more Congolese meals and larger portions than the regular menu. Coffee breaks with a snack can also be requested for the morning and afternoon.